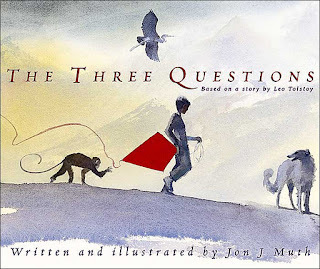 In this beautifully rendered retelling of Leo Tolstoy's short story, Jon J. Muth creates a simple and resonant opening for deep conversations with children about character. I have used this fable with upper elementary students as a way of elaborating upon discussions of freedom, personal choice and responsibility. I begin with just the three questions, prior to reading the story. Students can journal their responses individually, have small group conversations, or share their ideas through a facilitated class discussion; each of these strategies has worked well in my experience. Partly because of the richness of the watercolor illustrations and partly due to the eloquence of the text, students immediately grasp the immediacy of the needs of the characters involved - they can feel the significance of what transpires. I encourage you to explore this story on your own, and then share it with students when you are ready. It is a life-affirming tale that can bring clarity to one's own world view, and strengthen the ties of a community who shares it.